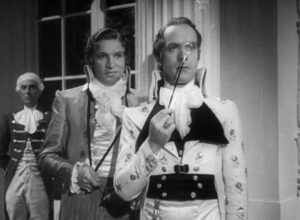 Though the celebrated 1934 version of The Scarlet Pimpernel is justly famous, few are aware that the film had a sequel less than three years later. There’s a reason for that: though produced by the same studio, almost no one who made the first movie was involved with the second, and the journeyman cast and crew of The Return of the Scarlet Pimpernel were unable to recapture the magic of the original. The story is based loosely on The Triumph of the Scarlet Pimpernel (1922), one of Baroness Orczy’s dozen sequels to the first novel. Sir Percy has promised Lady Blakeney not to return to France, and spends his time in England playing cricket, but in Paris under the tyranny of Robespierre, heads continue to fall to Mam’zelle Guillotine. Though the Scarlet Pimpernel has been exposed and confined to England, Robespierre is convinced that he’s still remotely managing a network of traitors in Revolutionary France, and orders Citizen Chauvelin to find a way to induce Sir Percy to come to Paris where he can be taken and executed. Raymond Massey was busy in 1937 appearing in other costume dramas as Black Michael, King Philip II, and Cardinal Richelieu, so Chauvelin is played this time around by the baby-faced Francis Lister, who was quite good as Gaston in Cardinal Richelieu. But though Lister’s Chauvelin is smart enough for the role, he entirely lacks Massey’s menacing edge. Before she was Lady Blakeney, Marguerite St. Juste was an actress from the theatrical demimonde of Paris, so Chauvelin hatches a plot involving another actress, Theresa Cobarrus (Margaretta Scott), and sends her to England to lure Marguerite into an abduction—and so, in Brighton under false pretexts, Theresa tests her wits against those of the Blakeneys. Sir Percy is played by Barry K. Barnes, Marguerite by Sophie Stewart, and unfortunately, Leslie Howard and Merle Oberon they ain’t. The script doesn’t give them much to work with, either—especially poor Lady Blakeney, who seems to have lost about 40 I.Q. points since the first film. Sir Percy comes off rather better, but Barry Barnes just doesn’t have Leslie Howard’s ability to convey several simultaneous levels of nuance, and his dialogue isn’t as sharp. To save his wife, Sir Percy is drawn back into the fray of Revolutionary Paris, and the requisite impersonations, pursuits, intrigues, and daring escapes duly ensue. It’s not bad—but as Sir Percy remarked in the first film, “Really, there’s nothing quite so bad as something that’s not bad.” Watch for the young James Mason making his mark in a minor role as a revolutionary parliamentarian—radiating intensity, he stands out as the only real actor of stature in the picture. Ironically, this just diminishes the earnest but inadequate performances of the lead actors, forever eclipsed by Howard, Oberon, Massey—and Mason.